Passive DB server attacks. The curious database administrator (DBA) learns private data. Any attacks on all servers. The adversary gains complete control over application and DBMS servers. Support user-shared data while minimizing data leakage when both application servers and DBMS servers are compromised. “Different keys for different users” alone is not suitable for user-shared data. How to solve Challenge 1 (Threat 1+2) while still retaining data sharing (Challenge 2)? How to deal with Passive DB server attacks? No plaintext in database at all. SQL-aware encryption strategy with symmetric-key encryption (for efficiency). support order relations. If x < y, then OPEk(x) < OPEk(y) for any secret key K.
Weaker. Thus, OPE-encrypted columns are revealed to the server only when the order query is needed. retains IND-CPA while allows computations to be conducted on ciphertext and obtain an encrypted result which is the ciphertext of the result of operations performed on the plaintext. Server can only know whether the token matches. However, the query set is not always known in advance. So we need to dynamically adjust a layer of SQL-aware encryption scheme for queries at runtime. Onions of encryption: different keys for different layers of onions. The proxy will not give all keys to the server at any time. MK is the proxy’s Master Key and only intended for a single principal (user). INSERT and UPDATE queries make the proxy encrypts data to the layer that has not yet been stripped off. Addition and direct comparison should not be allowed simultaneously. If a column is incremented and then only projected, DBMS operates on add onion. If a column is used in comparisons after increasing, proxy calculates the final value and updates it once and for all. At this time, we can defend against Threat 1 (passive DB server attacks) by not exposing any plaintext to the DBMS server while most SQL queries can still be supported. How to deal with any attacks on all servers while still retaining data-sharing among users? The proxy’s Master Key (MK) is not adequate for multi-users. The solution is to chain encryption keys to user passwords with the specification of key access policy among users. What does the key derives from? One Single principal uses Global proxy Master Key (MK). Multiple principals chain encryption keys to user passwords. A principal is an entity such as a user or a group, over which it is natural to specify an access policy. We need to support data-sharing, so the access control policy should be specified to the schema. 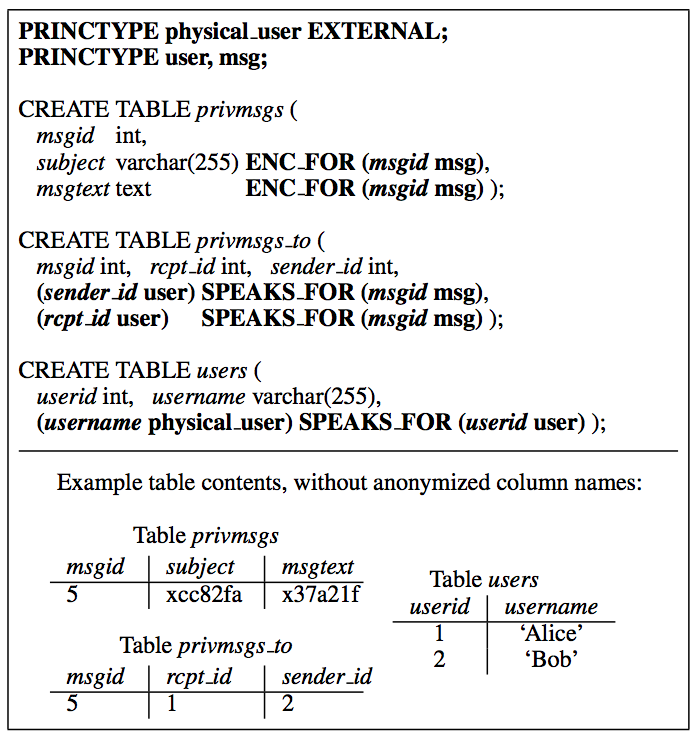 ENC_FOR(Sensitive-Column1, PrincipalA), A has access to column1. (principalA typeX) SPEAKS_FOR(principalB typeY), A has access to all keys that b has access to. When a user logs in, the proxy loads all the key the user has access to. When a user logs out, the proxy delete all the user’s keys in the memory. At this time, threat 2 is successfully conquered while the data-sharing feature is retained.